What would happen if we allowed plants have their own way and to grow as and where nature decides? 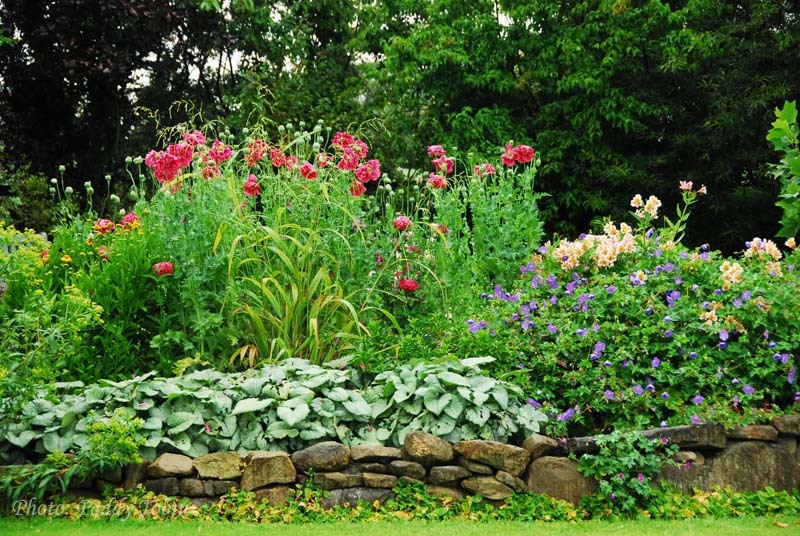 Would it be chaos or just another facet of our gardens? 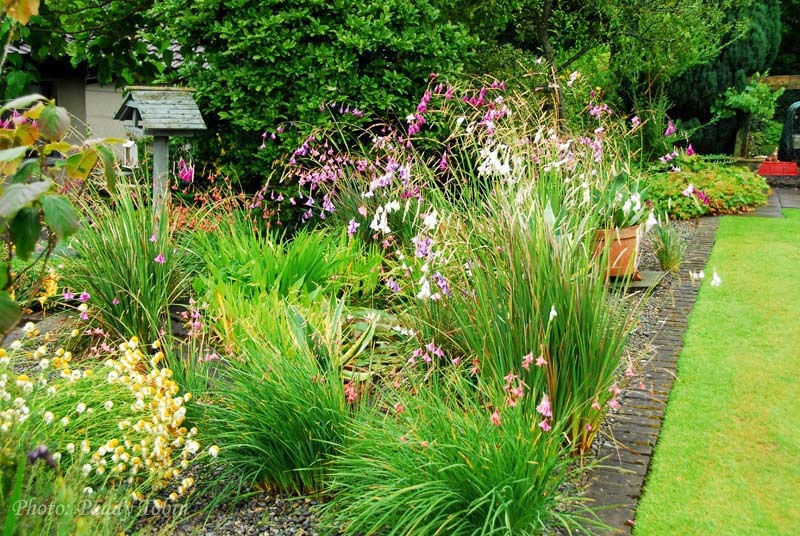 The thought of allowing plants to have their unbridled way in the garden is, perhaps, too much for most gardeners who see their creation and control as being at the essence of their gardens. A space without their control might not be considered a garden at all but simply a wild patch but, perhaps, this wild patch can be managed and then considered a thing of beauty. The annual opium poppies which are an delight in the garden. 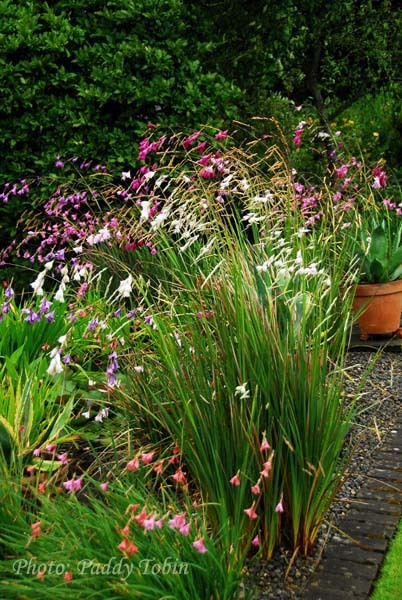 There is a range of plants which delight us each year by their random habits. They pop up here and there where it suits them and we must take them as they come or remove and do without them. They are whimsical and self-willed; they are in charge and grow on their conditions so that if we love them we must also tolerate their ways. 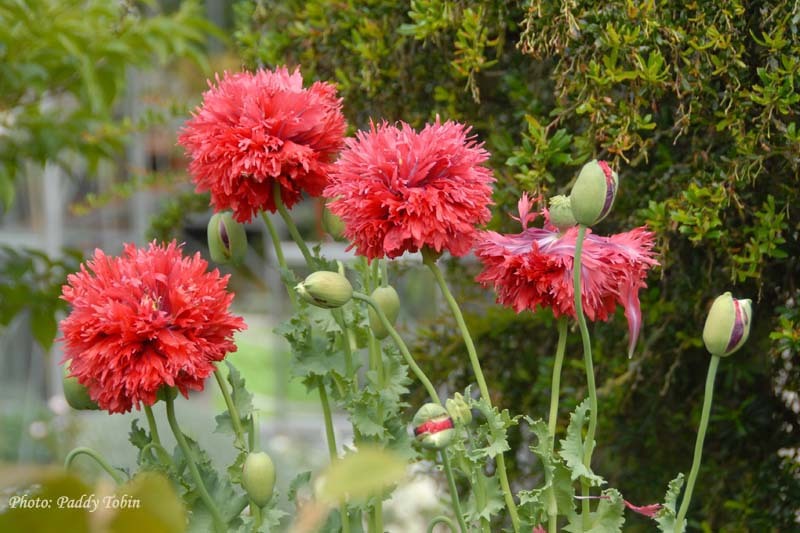 My garden would certainly be the poorer without the annual flush of opium poppies with their richly coloured and fluffy flower heads, followed by their architectural seed heads. Dieramas are in flower here as I write and most are not the same as the original plants we introduced some twenty years ago; they have crossed with each other, scattered their seed and have produced some beautiful colour variants. I would not be without their random beauty though it is largely outside my control. 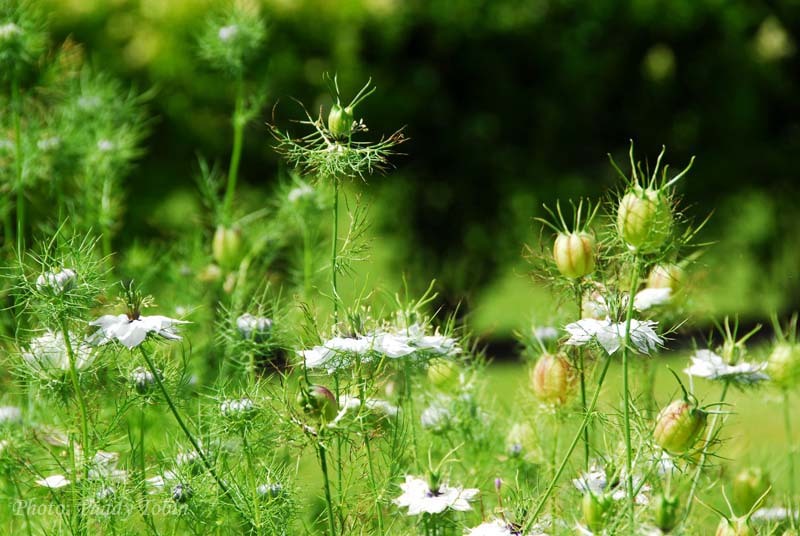 Ammi majus and Nigella damacena ‘Miss Jekyll White’ seed about in profuse numbers a white garden here. They are light and airy plants which fill in between the main planting of the area and give a fluffy display which is simply wonderful each year. 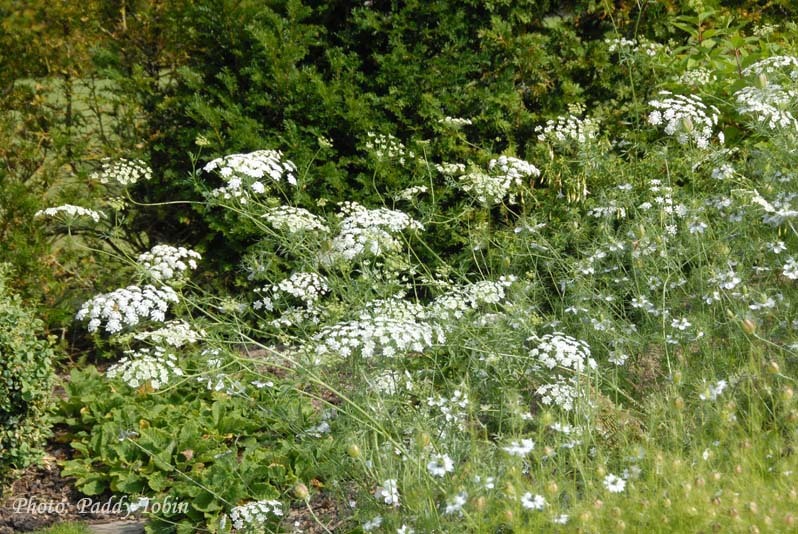 While we collect seed of the Ammi to be sure we will have more plants to place where we would like them those scattered by nature always seem to give just the right effect. 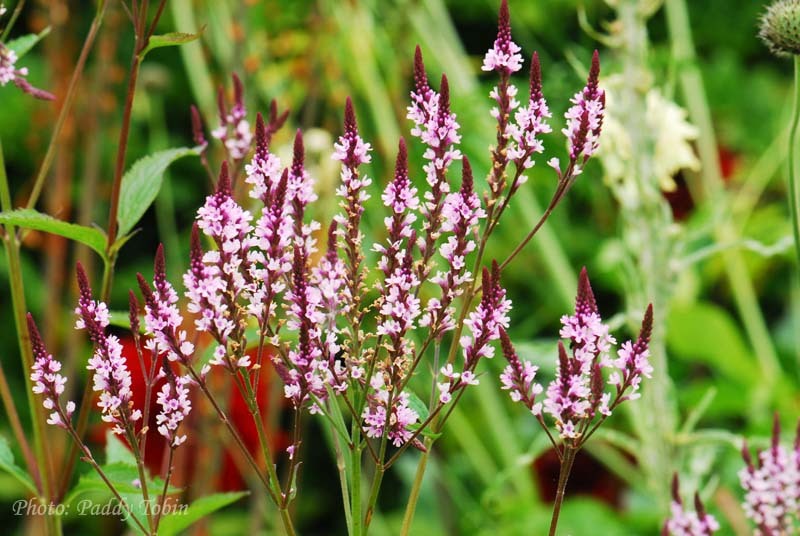 Verbena bonariensis and Verbena hastata behave in a similar manner and add that beautiful purple haze to a bed. 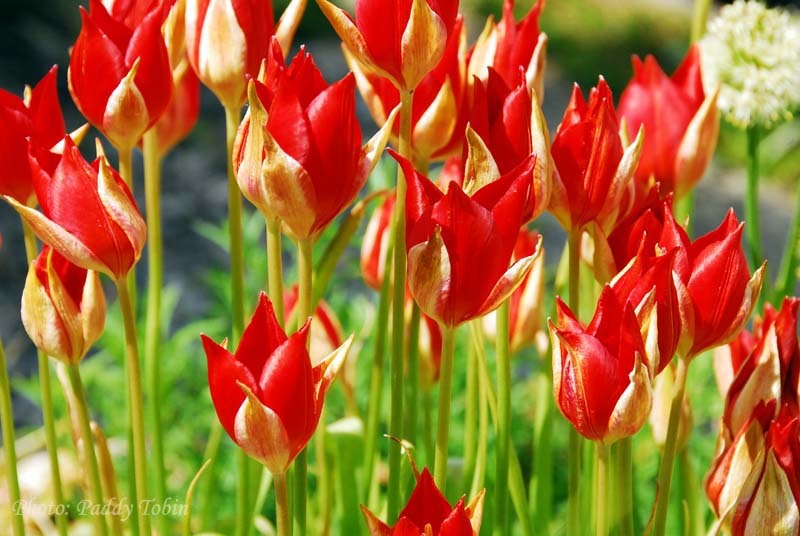 It is always a delight when Tulipa sprengeri spreads about by seed and I have failed to grow Corydalis wilsonii or Corydalis ochroleuca where I have wished it to be but am never without them as they seeded many years ago into cracks at the base of the house and around the glasshouse and have persisted there without any help from me. And, who would be without “Miss Willmott’s Ghost”! Nigella damascena ‘Miss Jekyll White’ which seeds about very generously but can be kept in check very easily. So, though my first impressions on reading this latest book to come my way, “Cultivating Chaos” were that it was a style or approach to gardening which was not for me I found, on consideration, that there are many suggestions outlined in the book which I already employ in the garden and that they add greatly to the spontaneity and enjoyment of the garden. While I might immediately baulk at the thought of “cultivating” chaos, on reading this book, I realised that I actually enjoy a certain degree of chaos, freedom of plants, spontaneity and allowing nature to have its way. The subtitle, “How to enrich landscapes with self-seeding plants” more accurately describes this approach to gardening. It is not simply allowing the garden to run to seed, go wild and out of control but an approach which welcomes a certain level of leaving plants do their own thing while keeping an eye on this and selecting and refining the results. 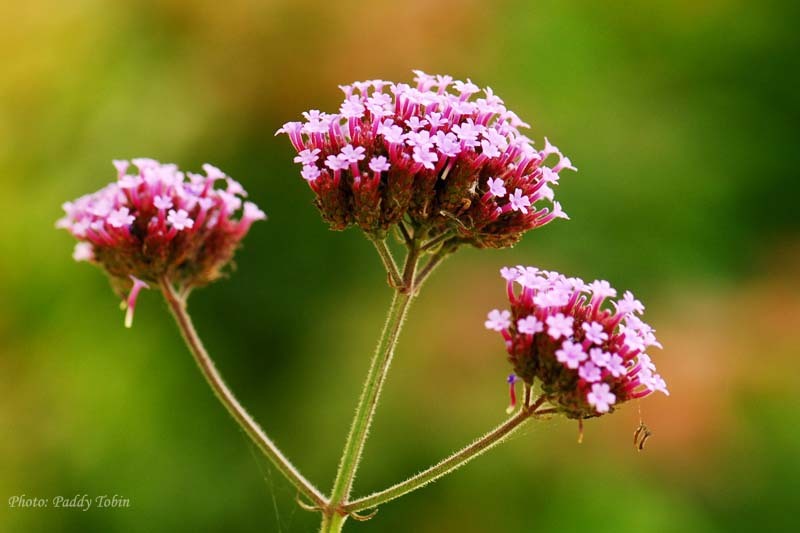 Verbena bonariensis, a very popular self-seeding plant in our gardens at present. Verbena hastata, another pretty self-seeder in the garden. The book covers all the practicalities from which plants to use, how to prepare soil, where to plant them, plant lists and descriptions, how to manage the plants as the years go on and how to care for one’s meadow – an essential requisite these days! However, along with the necessary and information practical aspects of the book there are those delightful sections which describe the projects of others and give us beautiful photographs to inspire us to do likewise. There is an in-depth examination of nature at work at Dungeness in Kent and a peep into Derek Jarmin’s garden there. There is an extensive description of Het Vlackeland, the two acre garden of landscape designer Madelien Hasselt and her partner Willy Oorthuijsen in the Netherlands and also the work of Piet Oudolf, Henk Gerritsen and Ton ter Linden. The chapter on Waltham Place, the home of Nicky and Strilli Oppenheimer, is fabulously interesting as it shows how a formal garden has been transformed into a naturalistic one over the last fifteen years, chaos within a framework so to speak. 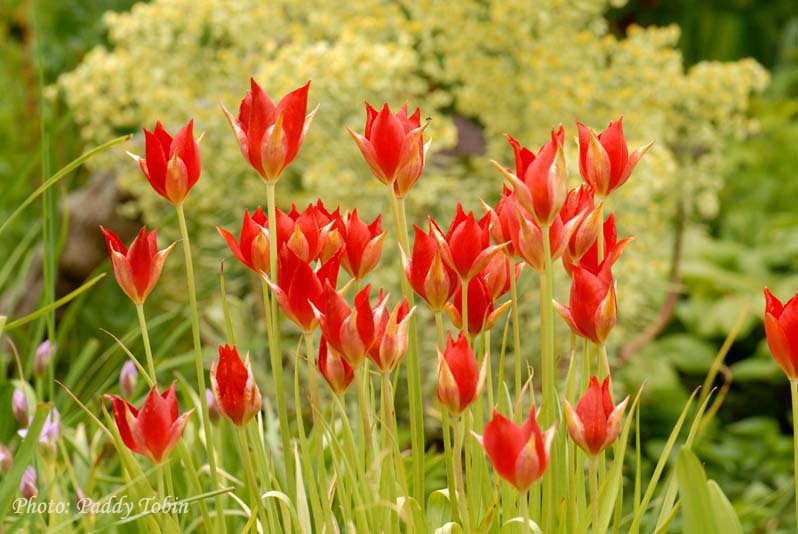 Tulipa sprengeri which increases in the garden thought its own self-seeding. There is much in this book to recommend it; it is well written and beautifully illustrated and it may well, if not change your approach to gardening entirely, lead you to allow some level of freedom to your plants and you will enjoy the design and spontaneity of nature which results. An aside: Reading this book about self-seeding plants in the garden brought several amusing comments to mind. I have heard a gardener, boasting of their latest rare and unusual plant, brought back to earth with the comment, “Oh, that old thing; it seeds everywhere on me; a nuisance!” Gardeners, in general I think, dislike the pompous or the boastful. A painful back, sore knees and dirty hands will generally knock that guff out of the practical gardener. 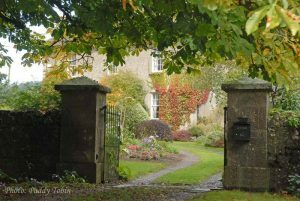 Of similar vein, I recall Helen Dillon’s recounting of Christopher Lloyd comments on how good the maintenance was in her garden as though this was the best he could find to say about the garden, a gentle put-down in effect. It was said only to tease, of course, as he could not but admire the garden. I had friends in the garden some weeks back and one commented so many times on how impressed he was with the imposing structure of the new bridge which is in the background, what wonderful “borrowed landscape” it was, “striking piece of sculpture/architecture” etc that I began to wonder if it was a case that he could find nothing to compliment within the garden and, wishing to be polite and positive, complimented me on the garden background and setting instead. I will listen ever so carefully when next he comes around and, if he continues in like vein, I will spare us both by not asking him to come again. Good setting and background! Pffff! I will also give him a packet of one of those horrible grasses which seeds everywhere and delight in the chaos and nuisance it will cause him. An area where dieramas are allowed free (almost) rein. Opium poppies making an impact in a bed in the garden. 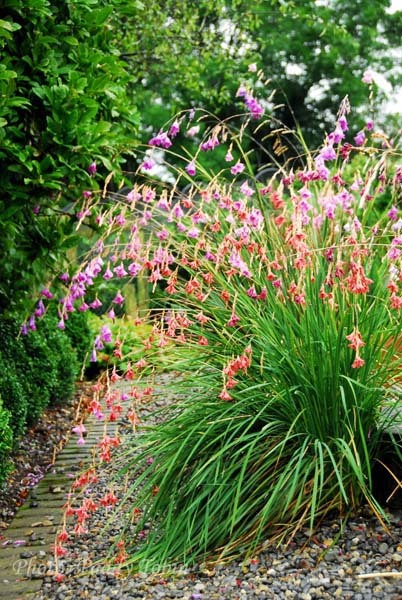 To find out more about the Irish Garden Plant Society visit our website or follow us on Facebook. Is there a bridge near your garden Paddy? I never noticed it! Very enjoyable article the book sounds very interesting I must have a look. Oh, but you have always been so circumspect and have pretended not to notice it. lolol I’ll keep the book for you. And there are a few plants thrown up at the compost bin also for collection, nothing special: brunnera, allium and libertia.